Does your Bar Dog have the UGLIEST sweater? Bar Dog wine is hosting an ugly holiday sweater party - dogs only! Dress up your pup, upload a photo and you'll be entered for a chance to win. One grand prize winner will be awarded with Bar Dog-branded goodies and a six-month subscription to Bark Box. Ten runner ups will receive a gift basket with Bar Dog-branded goodies. Winners pulled January 2, 2019. Get your entries in! Must be 21 to enter. No purchase necessary. Void where prohibited. By uploading a photo, you give Bar Dog wines permission to use your photo in future marketing materials. Sign me up for the Wine Sisterhood mailing list! Sign me up for the Bar Dog mailing list! 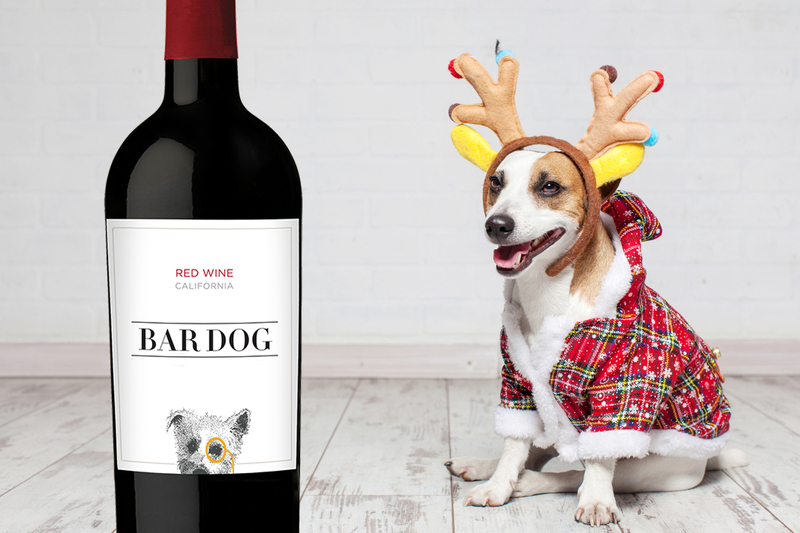 Eligibility: The “BAR DOG WINE HOLIDAY UGLY SWEATER 2018 SWEEPSTAKES” (“Sweepstakes”) is open only to U.S. residents 21 years of age and older. The Sweepstakes is void where prohibited or restricted by U.S. or local law. Any individuals (including but not limited to employees, consultants, independent contractors, and interns) who have, within the past six months, performed services for Sponsor, Administrator, any organizations responsible for sponsoring, fulfilling, administering, advertising or promoting the Sweepstakes or supplying the prizes, and/or their respective parent, subsidiary, affiliated and successor companies, and immediate family and household members of such individuals, are not eligible to enter or win any prize. “Immediate family members” shall mean parents, stepparents, children, stepchildren, siblings, step-siblings, or spouses, regardless of where they live. “Household members” shall mean people who share the same residence at least three months a year, whether related or not. Sweepstakes Schedule: The sweepstakes is a simple sweepstakes. You submit your entry for a random drawing. One (1) winner will be pulled at random on 1/2/19. The winner will be awarded a six month subscription to Bark Box. The entry period begins on or about 11/26/18 at 12:01am PT and ends on or about 1/1/19 at 12 pm PT. Sponsor’s computer is the official clock for the Sweepstakes. No online entries will be accepted after 1/1/19 at 12 pm PT. How to enter: You may enter by uploading a photo of your dog and completing the required fields on the official entry form at https://bardogwine.shortstack.com/XHgPfQ. Entrant further warrants and represents that he/she has fully complied with these Official Rules. By uploading your photo, you agree to let Bar Dog and Vintage Wine Estates use your photo for future marketing purposes. By entering the Sweepstakes, entrant agrees to indemnify and hold harmless Released Parties (as defined below) from any action or liability resulting from his/her participation in this sweepstakes. Sponsor and its agencies are not responsible for failed, partial or garbled computer transmissions, or for technical failures of any kind, including but not limited to electronic malfunction or damage of any network, hardware or software. If for any reason the Sweepstakes (in whole or in part) is not capable of running as planned, including infection by computer virus, bugs, tampering, unauthorized intervention, fraud, technical failures, fire, flood, storm or other natural cataclysm, riot, strike, civil commotion, governmental regulation or any other causes beyond Sponsor’s control that corrupt or affect the administration, security, fairness, integrity or proper conduct of the Sweepstakes, Sponsor reserves the right, in its sole discretion, to disqualify any individual who tampers with the entry process, and to terminate, modify or suspend the Sweepstakes (including but not limited to terminating/suspending the Sweepstakes in one or more jurisdictions). In such event, Sponsor reserves the right to conduct the Promotion and award the Prizes in the Sweepstakes (as discussed below) in a manner which is fair, appropriate and consistent with these Official Rules, as determined by Sponsor in its sole discretion. Notice of termination/modification/suspension of Sweepstakes will be posted on the website. No responsibility is assumed for any error, omission, interruption, deletion, defect, delay in operation or transmission, communications line failure, theft or loss, destruction or unauthorized access to, or alteration of, entries; or any problems or technical malfunctions of any telephone network or lines, computer online systems, servers, or providers, computer equipment, software, failure of any e-mail or electronic entry to be received on account of technical problems or traffic congestion on the Internet or at any website, or any combination thereof, including any injury or damage to entrant’s or any other person’s computer related to or resulting from participation in or downloading any materials from this Sweepstakes. Selection: Vintage Wine Estates will track entrants via the official Shortstack entry form. The winners will be chosen at random using Random.org. Winner will be contacted 24 to 48 hours after the end of the entry period. Winner will be contacted via the email address provided in the entry form. If there is no response after 24 hours from being contacted, an alternate winner will be chosen. The same process will continue to take place until a viable winner is selected. Sweepstakes Prize, Approximate Retail Value (“ARV”): One grand prize winner will be awarded with a six month subscription to Bark Box. Approximate retail value: $150. Ten (10) runner ups will receive Bar Dog-branded swag items. Approximate retail value: $50. Delivery of prize to the winner will be managed by Vintage Wine Estates. Prize Package items subject to availability and may be substituted with items of equal value. Use of third party trademarks are for purpose of prize description only and such use is not intended to suggest or imply sponsorship, endorsement, or the approval of this Promotion. Winner is solely responsible for all other expenses related to the prizes not specified herein. No substitution or transfer of prizes except with Sponsor’s written permission or where required by law. If for any reason announced prizes become unavailable, Sponsor in its sole discretion may award substitute prizes of equal or greater value. All applicable taxes are the sole responsibility of the winner, who will receive a 1099 tax form reflecting actual value of their prizes if in excess of $600. Potential Prize winner will be notified by phone only using information provided at initial registration. Due to fast turnaround needed for dispensing the prize, twenty four (24) hours after notification and/or return of e-mail notification a chosen winner may be disqualified and an alternate winner chosen. Potential Prize winner will be required to accept the prize package via phone. The alternate winner will also be chosen randomly. In the event of any dispute concerning the identity of any online entrant, the entry will be deemed submitted by the natural person who is the authorized holder of the transmitting e-mail account. “Authorized account holder” is defined as the natural person who is assigned to an e-mail address by an Internet access provider, online service provider, or other organization (e.g., business, educational institution, etc.) that is responsible for assigning e-mail addresses for the domain associated with the submitted e-mail address. General Conditions: By participating, entrants agree to be bound by and abide by these Official Rules and the decisions of Sponsor and Administrator, which shall be final and binding in all respects. Sponsor reserves the right in its sole discretion to disqualify any individual it finds to be tampering with the entry process or the operation of the Sweepstakes or to be acting in violation of these Official Rules. Any attempt by any person to deliberately undermine the legitimate operation of the Sweepstakes may be a violation of criminal and civil law, and, should such an attempt be made, Sponsor reserves the right to seek damages from any such person to the fullest extent permitted by law. Sponsor’s failure to enforce any term of these Official Rules shall not constitute a waiver of that provision. Entry into the Sweepstakes constitutes prize winner’s permission for Sponsor, Administrator and their respective successors, representatives and assigns to use their submissions, name, voice, likeness, photograph, prize information, biographical data and city and state of residence in programming, advertising, trade and/or promotional material or on a winner’s list without compensation or notice, to the extent permitted by law. Sponsor is not obligated to use any of the above-mentioned information or materials, but may do so and may edit such information or materials, at Sponsor’s sole discretion, without further obligation or compensation. Limitation of Liability: By participating in this Sweepstakes, entrants agree to release and hold harmless Sponsor, Administrator, their respective parent, subsidiary, affiliated and successor companies, advertising and promotion agencies and prize suppliers, and each of their respective officers, directors, agents, shareholders, representatives and employees, as well as each of their respective successors, representatives and assigns (collectively, the “Released Parties”) for: (1) any incorrect or inaccurate information, whether caused by entrants, printing errors or by any of the equipment or programming associated with or utilized in the Sweepstakes; (2) technical failures of any kind; (3) unauthorized human intervention in any part of the entry process or the Sweepstakes; (4) technical or human error which may occur in the administration of the Sweepstakes or the processing of entries; or (5) any injury or damage to persons or property which may be caused, directly or indirectly, in whole or in part, from entrant’s participation in the Sweepstakes or receipt or use or misuse of prize. No more than the prizes stated above will be awarded. Disputes: To the fullest extent permitted by law, entrant agrees that: (1) any and all disputes, claims and causes of action arising out of or connected with this Sweepstakes or any prize awarded shall be resolved individually, without resort to any form of class action, and exclusively by courts of the State of California; (2) any and all claims, judgments and awards shall be limited to actual out-of-pocket costs incurred, including costs associated with entering this Sweepstakes, but in no event attorneys’ fees; and (3) under no circumstances will entrant be permitted to obtain awards for, and entrant hereby waives all rights to claim, indirect, punitive, incidental and consequential damages and any other damages, other than for actual out-of-pocket expenses, and any and all rights to have damages multiplied or otherwise increased. All issues and questions concerning the construction, validity, interpretation and enforceability of these Official Rules, or the rights and obligations of the entrant and Sponsor in connection with the Sweepstakes shall be governed by, and construed in accordance with, the laws of the State of California, without giving effect to any choice of law or conflict of law rules (whether of the State of California or any other jurisdiction), which would cause the application of the laws of any jurisdiction other than the State of California. Winners List: For the names of the winner, email info@winesisterhood.com and provide your name and full mailing address. Requests must be made before 06/01/2019.